In the EDEN ISS greenhouse, DLR researcher Paul Zabel holds the first harvested lettuce in his hands. 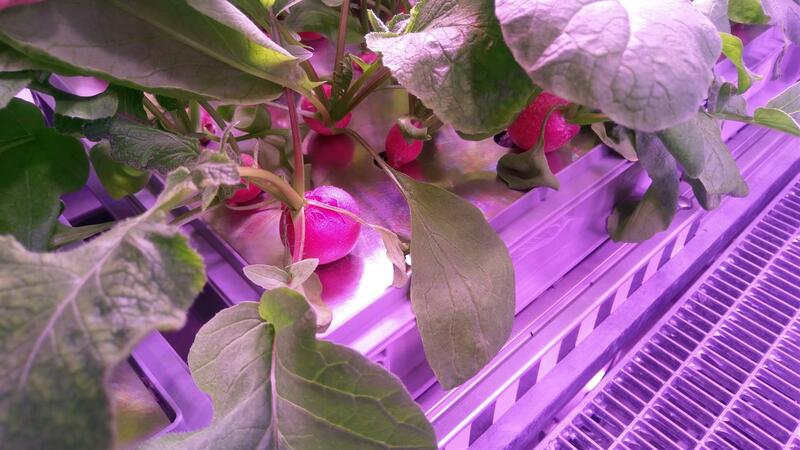 Radishes before the first harvest in the EDEN ISS greenhouse. The plants are cultivated under artificial light and without soil. Their roots are regularly sprayed with a nutrient solution. 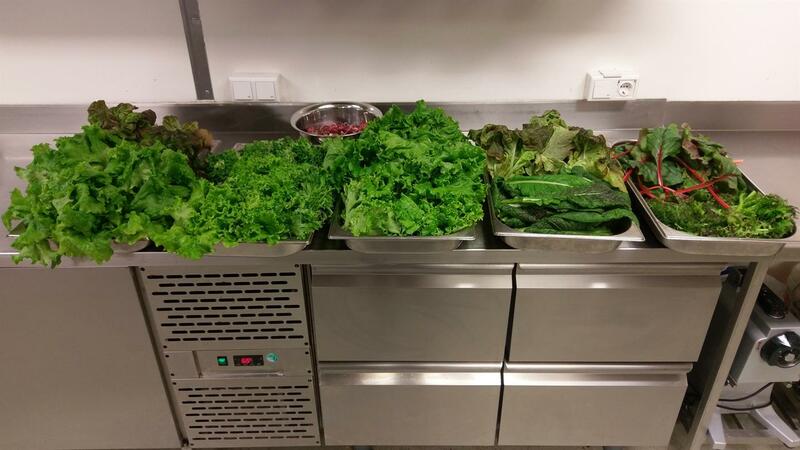 Lettuce leaves and radishes from the first harvest in the Antarctic greenhouse EDEN ISS, laid out in the kitchen at Neumayer Station III. 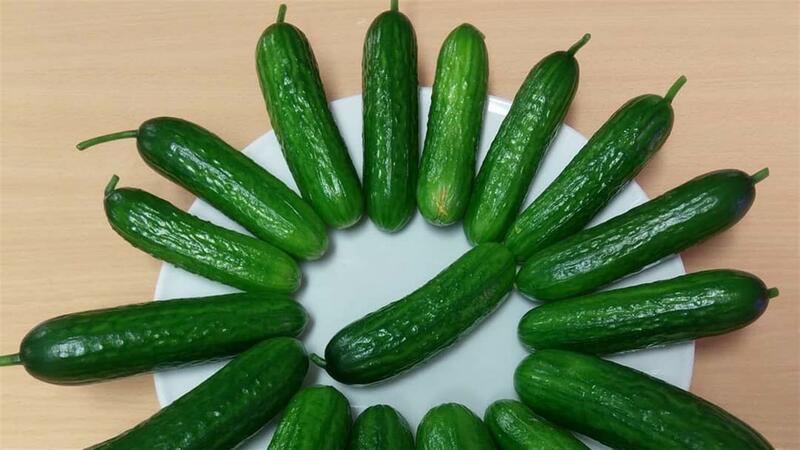 The first cucumbers grown in the EDEN ISS greenhouse. Out of the EDEN ISS greenhouse and straight onto the plates of the Antarctic overwinter crew. 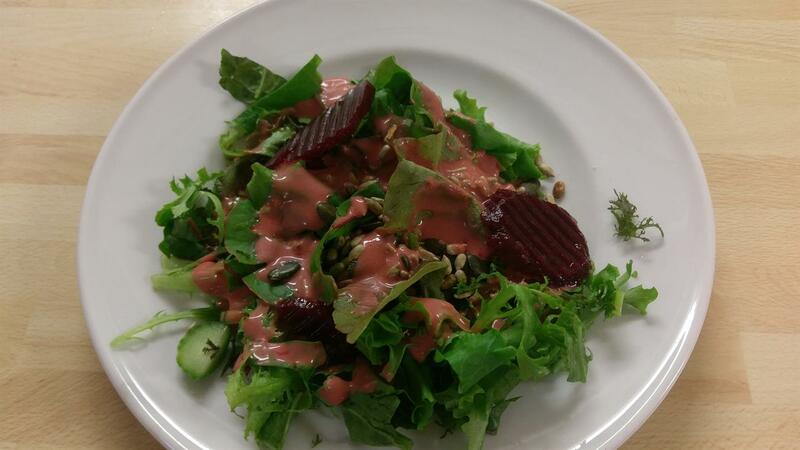 The salad here is served with a raspberry dressing and beetroot. While the temperatures in the Antarctic gradually drop below 20 degrees Celsius and the Sun barely rises above the horizon, the plants being cultivated in the experimental greenhouse EDEN ISS are growing and thriving. After the first three weeks, Paul Zabel from the German Aerospace Center (Deutsches Zentrum für Luft- und Raumfahrt; DLR) has, over the last few days, harvested the first crops in the cold environment. The first harvest produced 3.6 kilograms of lettuce, 70 radishes and 18 cucumbers. What is now destined to enrich the diet of the overwintering crew demonstrates how astronauts on future Moon and Mars missions could be supplied with fresh produce. "Once I had finished sowing in mid-February, I struggled with a few unexpected difficulties, such as minor system failures and the fiercest storm of the last year," explains Zabel, an engineer and Antarctic gardener from the DLR Institute of Space Systems. "Thankfully, I was able to fix all the problems and survive the ordeal." Project Manager Daniel Schubert adds: "We have learned a lot about self-contained plant cultivation in recent weeks, and it has become evident that the Antarctic is an ideal test environment for our research." Now all the planned plants are growing in the greenhouse, including radishes, various types of lettuce, tomatoes, cucumbers, peppers and herbs (basil, parsley, chives and coriander). "The cultivation of strawberries is the only thing that we have not yet started," says Schubert. “We are still waiting for a successful sowing." The DLR researchers expect the container greenhouse to be operating at full capacity in May. They will then be able to harvest four to five kilograms of fresh vegetables each week. A 10-strong overwintering crew is currently living in the Alfred Wegener Institute's Neumayer Station III. The fresh vegetables they received with the last delivery at the end of February have all been consumed, so the residents are happy with the new additions to their menu. "Seeing our first fresh Antarctic salad was a truly special moment," says station manager Bernhard Gropp. "It tasted like it had just been harvested from the garden." Currently, Zabel spends three to four hours per day tending to the plants in the greenhouse, which is situated approximately 400 metres from Neumayer Station III. He is mainly occupied with checking the technical systems and typical gardening activities such as pruning the plants. Meanwhile, he is in regular contact with the control centre at the DLR Institute of Space Systems in Bremen, which is monitoring the plant cultivation remotely. On particularly stormy days, for instance recently on 21 March, Daniel Schubert and his team, Matthew Bamsey and Conrad Zeidler, are solely responsible for monitoring the greenhouse from Bremen until Paul Zabel is able to make his way from the station. This temporary measure can be maintained for up to three days. The EDEN ISS project will be conducted during an overwintering mission at the German Antarctic station Neumayer III, in collaboration with the Alfred Wegener Institute, Helmholtz Center for Polar and Marine Research (AWI). A large number of other international partners are contributing to a research consortium under the auspices of DLR, ensuring that the greenhouse will work smoothly in the Antarctic: Wageningen University and Research (Netherlands), Airbus Defence and Space (Germany), LIQUIFER (Austria), the National Research Council (Italy), the University of Guelph (Canada), Enginsoft (Italy), Thales Alenia Space (Italy), Arescosmo (Italy), Heliospectra (Sweden), the Limerick Institute of Technology (Ireland), Telespazio (Italy), and the University of Florida (USA) all form part of the consortium of the EDEN ISS project. The project is financed with funds from the EU Framework Programme for Research and Innovation under project number 636501. The EDEN ISS channels on Facebook and Instagram and under the #MadeInAntarctica hashtag on Twitter publish regular news about the project directly from the Antarctic. More detailed information can be found at www.DLR.de/EDEN-ISS.